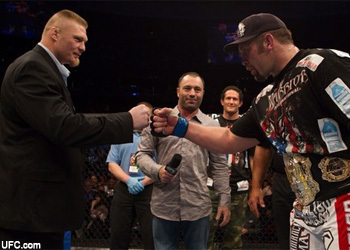 When Brock Lesnar and Shane Carwin slam the cage door Saturday night at UFC 116, the biggest fight in Octagon history will officially be going down – in more ways than one. Although both champions are among the few heavyweights that actually have to cut down to meet the 265-pound weight limit, neither intend on coming in too big for their title unification bout inside the MGM Grand Garden Arena in Las Vegas. “I am about 277/278 today. Easy cut,” Carwin Tweeted Tuesday afternoon. Lesnar recently told longtime confidant Paul Heyman that his new 3,200 calorie-a-day diet has allowed him to consistently remain in the best shape of his life, as he’s on the doorstep of the biggest scrap of his career. While other UFC champions have suffered through 20-pound weight cuts in order to be the more physically imposing athlete when the horn sounds, these heavyweights are looking to come in right at the Mendoza Line to ensure every last ounce of energy will be directed towards their adversary. Lesnar is an early favorite (-145) to extend his professional record to 5-1, however his line has dropped quite a bit so the money appears to be heading in Carwin’s direction.